This is a beautiful memoir of a friendship between two writers, Ann Patchett and the poet Lucy Grealy. I read this back in 2006, and it's still one of my favorite books about the nature of friendship and the bonds that we form with others. "Her lower jaw had been a ledge falling off just below her cheekbone when we started college, making her face a sharp triangle, but now the lines were softer. She couldn't close her mouth all the way and her front teeth showed. Her jaw was irregular, as if one side had been collapsed by a brutal punch, and her neck was scarred and slightly twisted. She had a patch of paler skin running from ear to ear that had been grafted from her back and there were other bits of irregular patching and scars. But she also had lovely light eyes with damp dark lashes and a nose whose straightness implied aristocracy. Lucy had white Irish skin and dark blond hair and in the end that's what you saw, the things that didn't change: her eyes, the sweetness of her little ears." Ann and Lucy became close when they were in grad school together in Iowa. They both had new dating experiences, and the slower pace of life in the Midwest made them feel like they were "impossibly rich in time." They filled their days with reading and teaching and dinner and dancing and, of course, writing. "We shared our ideas like sweaters, with easy exchange and lack of ownership. We gave over excess words, a single beautiful sentence that had to be cut but perhaps the other would like to have. As two reasonably intelligent and very serious young writers in a reasonably serious writing program, we didn't so much discuss our work as volley ideas back and forth until neither of us was sure who belonged to what." 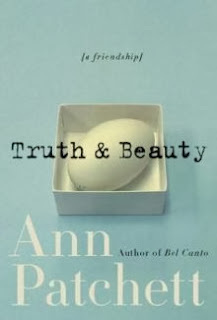 After grad school the two friends moved away but stayed in touch with visits and heartfelt letters, some of which Ann includes in the book. Sadly, Lucy later got involved in drugs and died too young. Ann would often dream of her, and she would have a conversation with her dear friend. "Night after night after night I find her, always in a public place, a museum, a restaurant, on a train. Every night she's glad to see me and she folds into my arms. But each time there is less of her to hold on to ... In this little way I am allowed to visit my dead." I was drawn to the book because I had loved Ann Patchett's novel "Bel Canto," so I picked it up just on name recognition. Her writing is lovely and sincere, and it made me adore Patchett even more. I highly recommend the book to writers and to anyone who loves a good story of friendship. "I'd want to see my friend Lucy Grealy again. I'd want to know how the afterlife was treating her, if there was anything or everything about this world she missed. She'd say to me, 'My God, how did you get here?' And I would say, 'The New York Times Book Review told me I could meet any writer, living or dead, and I picked you!' Then I imagine there would be a great deal of hugging and dancing around." Let's All Move to Vermont!